Four intrepid birders, Jim Deming, David Gill, Jim Harman, and I decided that we needed to travel to Gunnison, Colorado to see the Gunnison Sage Grouse, a new species which was split several years ago from the larger, Greater Sage Grouse whose range is farther north. But we also wanted to see them dancing (I guess it is more accurately called fighting). 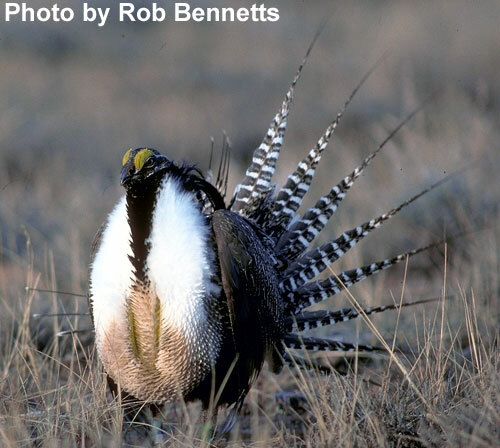 The Gunnison Sage Grouse dance throughout much of April, the same time as the Greater and Lesser Prairie Chickens here in Oklahoma. So, a coordinated trip would yield all three, with luck. My trip began was when I traveled from Broken Bow to Fort Gibson on April 5, stopping en route at Tenkiller Lake to scope for the Yellow-billed Loon reported a couple of days earlier. 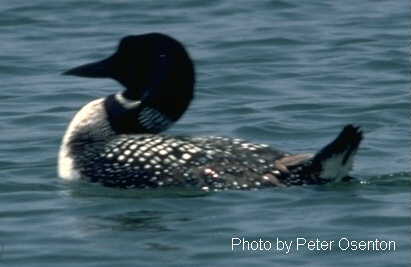 I had no luck with the Yellow-billed, but I saw many Common Loons in their attractive breeding plumage, and a few entertained me with distant, mournful yodels. I spent the night at the home of Jim and Joan Harman in Fort Gibson, and very early next morning, on April 6, Jim and I headed to the Depot Restaurant north of Wagoner where we met other birders planning to see the Greater Prairie Chicken dance. Visiting these dancing Chickens is an annual event hosted by the Indian Nations Audubon Society. All the Chicken watchers departed the Depot and headed for the lek (chicken dance hall) at 5:30 AM, to arrive at the site about daylight. As expected, the Greater Prairie Chickens arrived at the lek about daylight and began dancing and fighting (rough dance hall). But sadly, only 3 males showed up for the dance. What was once a virgin prairie providing habitat for clouds of Prairie Chickens has, for decades, been a wheat field, a change the Chickens had no choice but to accept, so they continued to come but in ever dwindling numbers. This year, the dance hall is destined to be a corn field and had been plowed, providing only a dirt floor for the dance. The landowner has been very nice to let us drive into his fields to look at the Chickens over the years, and cannot be faulted for making a living. This year could be the last for this lek, but when we left, we did see a group of about 5 Prairie Chickens, apparently at a lek about 2 miles from the lek we visited. But it still does not look hopeful for Greater Prairie Chickens in this area. Other interesting animals we observed at and near the lek was a Coyote that kept trotting back and forth near the Chickens and making half-hearted passes at them, but they simply moved out of his way. We also saw a Golden Plover in the area and Common Snipe as we walked back to our vehicles. We all returned to the Depot Restaurant for a very good breakfast and a recap of the morning birds. As we Gunnison-bound birders sat and planned our next day, Jeri McMahon decided that she and her friend Nancy States, visiting from Santa Barbara California, would follow us as far as Woodward so she and Nancy could see the Lesser Prairie Chickens. This Chicken and the Greater were both life birds for Nancy, so we all wanted her to get a look at them. We headed west, birding along the way, and getting many Oklahoma year birds. It is amazing how handy little radios can be when caravanning to keep in touch with each other. We detoured slightly at Dover to visit the Dover Marsh which is often covered with waterfowl, but not this time. We still got a fair sampling of Ducks so the detour was not in vain. We headed on to Woodward for the night and celebrated the day’s good birds, especially Nancy’s life bird for the day, the Greater Prairie Chicken. Next morning, on April 7, we drove northwest of Woodward to a lek on private land where we were able to observe the dance of the Lesser Prairie Chickens. 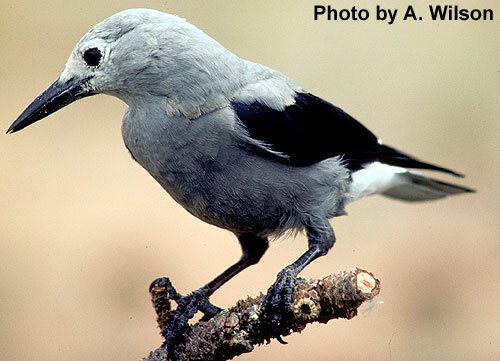 This species is declining at an alarming rate due to one reason--money. For example, a landowner who plows his prairie and plants grain crops eliminates the Prairie Chickens, but attracts Ring-necked Pheasants. He can harvest his grain and then lease the hunting rights for this game bird for a substantial sum. 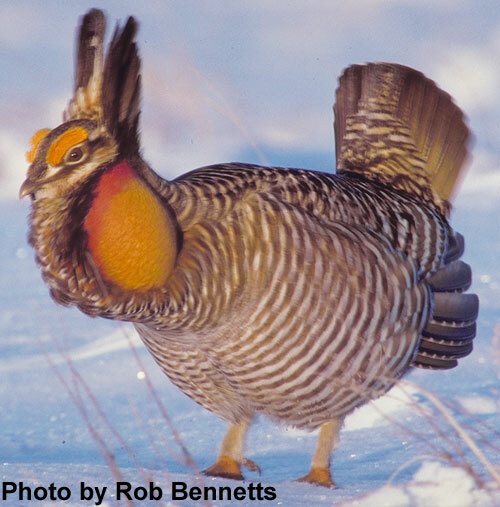 The landowner who protects his virgin prairie attracts only Lesser Prairie Chickens which cannot be hunted due to their protected status and, therefore, have no economic value. It is not fair, but it is a fact. The lek we visited was being worked by government researchers, and traps were set out on the lek to capture Chickens for banding and monitoring. In order to keep from disturbing the Chickens on the lek, we observed from the adjacent county road. The grass was rather high for clear viewing, but several birds stood on top of the traps to give us excellent views. Jeri and Nancy had to return to Fort Gibson due to prior commitments, so we bid them adieu and, once more, headed west, birding as we traveled (naturally!). We spotted an interesting bird in the middle of the panhandle where there is hardly a drop of water due to a severe, extended drought. We were passing a farm house when a large bird flushed from a small puddle in the barnyard. 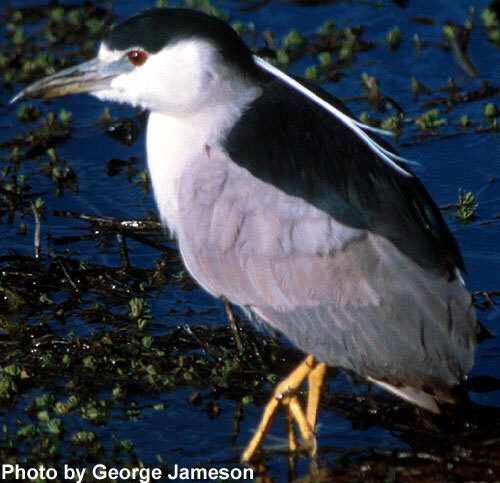 We stopped to look, and saw that it was an adult Black-crowned Night-Heron. We were amazed at first, until a little farther down the road, we saw a large, dark bird perched on a power pole. 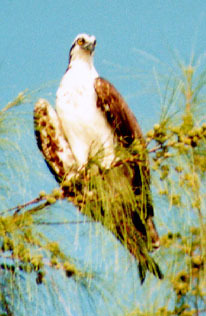 It turned out to be an Osprey in the driest, most remote place you can imagine. Someone commented that he must be waiting for a “land fish” to come along. We hope these water birds were able to find greener pastures. As we drove through Guyman, we spotted an Eurasian Collared Dove sitting on an electric line right above us. We continued on, and saw a well colored Ferruginous Hawk flush from a power pole beside the road. A little farther down the road, we spotted an immature Golden Eagle on a pole. We always wondered where birds sat before there were electric poles and lines. 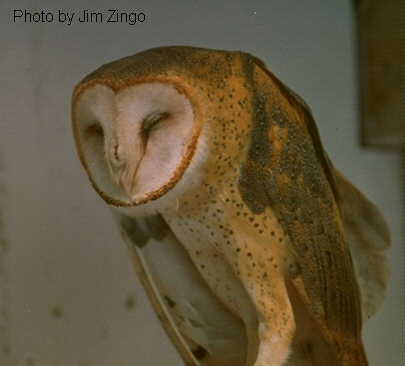 We stopped east of Boise City to see a Barn Owl which lives in an old barn by the road and is dependable. We also found the desicated remains of another Barn Owl beside the barn which may have been its mate. We hated to see it and wonder what event ended its life. By the time we reached Boise City, we had seen several Chihuahuan Ravens along the road. We continued to Black Mesa State Park southeast of Kenton, and headed toward Lake Etling to check the bird life there. At the prairie dog town south of the Lake, we saw two Burrowing Owls and two Golden Eagles. At the Lake we saw Bonaparte’s and Franklin’s Gulls, a Forster’s Tern, and two Bald Eagles which were a pair based on their size difference and interactions. We passed through the metropolis of Kenton, the last town in Oklahoma, and entered New Mexico. The road from Kenton to Folsom, New Mexico, is mostly gravel and is very rough. We bounced on down the road and, beyond Folsom, highway 72 is paved and smooth, plus it is very scenic. I would recommend that drive to anyone heading to Raton who has time. We turned north at Raton, and went over the 7,834 foot elevation Raton Pass to Walsenburg, Colorado, where we turned northwest toward Salida, driving along the east side of the spectacular Sangre de Christo range, another very worthwhile drive, especially in the late summer when aspens on these high mountains turn yellow. This drive yielded a large number of American Kestrels, probably migrants as there is not much selection of nest cavities. We turned west on highway 50 at Salida, heading for Gunnison. We reached the 11,312 foot elevation of Monarch Pass and stopped for a breath of fresh air, but there was only half a breath available at that elevation. We had gained an hour crossing into the Mountain Time Zone and we reached the road that led to the Gunnison Sage Grouse lek area in late afternoon, so we drove to the site to check out the area and plan where to park in the morning for best viewing. This lek is called the “Waunita lek” as it is on the road to Waunita Hot Springs, a resort 19 miles east of Gunnison. The Grouse lek area is open to the public for viewing from the road, but with very strict rules. You must arrive before daylight and remain in your vehicle at all times. No loud noise is allowed, even though the Grouse are about 250 yards away. A Game and Fish Department employee sits nearby to ensure compliance. We continued on to Gunnison where we spent the night. On April 8, before daylight, we were parked at the designated viewing area, along with about 5 other vehicles, to await the Grouse. Soon they came and began to dance and fight, like all the chickens do. Their breast sacs were inflated and showed two very prominent white patches of feathers. Their tails were fanned like a strutting Turkey and each feather resembled a dagger as it was very pointed. They had feathers on their heads which stood up like rabbit ears when they puffed up, as did the two species of Prairie Chickens we had seen the two mornings prior. We counted 28 Sage Grouse on this lek and observed them for a considerable time, reluctant to be the first observers to start an engine and disturb the quiet. Soon, 15 Grouse took flight and headed to the mountains. They fly quite a distance when they flush, and the flock passed in front of us on their way to wherever they went. A vehicle left so we finally left, each of us with a life bird to mark down. Too bad Jeri could not make it as she would have had a life bird, and that is a consideration because she has more than 700 North American species on her list. Before we left Gunnison, we drove around the town to look for bird feeders, but had no luck. I guess there are not many feeder birds in that harsh climate. I had read on the Colorado list serve (Internet) that Barrow’s Goldeneyes had recently been sighted at Blue Mesa Reservoir just west of Gunnison, so we drove there. It was not really cold but the reservoir was mostly iced over. However, on the east side of the reservoir, by the bridge, there was open water and we spotted a congregation of water birds, so we parked and broke out the scopes. 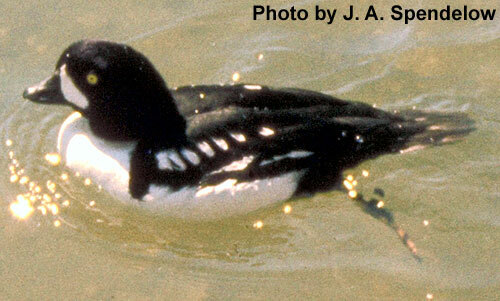 The birds were a mix, but included 6 Barrow’s Goldeneyes, lifers for everyone! The other water birds were mostly Common Mergansers and two Western Grebes. We headed south from Gunnison on highway 149, toward Lake City and the famous 11,361 foot elevation Slumgullion Pass. I had been told by a Colorado Fish and Game Biologist that White-tailed Ptarmigan have been sighted at this pass, but he did not have much hope of us spotting one. What we did spot was what must have been hundreds of Bluebird nest boxes on fence posts along the road for more than 30 miles. We saw Mountain Bluebirds using many. We guess that the state has some program which encourages people to build and erect nest boxes. The drive to the pass was very scenic as we kept climbing. We stopped on top to play a Boreal Owl tape on the very remote possibility that one might answer in daytime. We gave up on the Ptarmigan as soon as we stopped, as the suitable habitat was above the pass, up in the mountains, and we were not up to hiking in the rare air. So we loaded up and cranked up. It would be downhill from the pass, but my Explorer went only 10 feet before stopping (excuse me, Ford). It would crank and idle, but not run when put in gear. We did a poor facsimile of a Three Stooges mechanic routine using four stooges for awhile. Actually, Jim Deming is a fine mechanic of iron horses and guessed the problem was vapor lock. It might have been due to a serious vacuum leak in the brake booster line, which Jim also discovered. The old Explorer finally got fed up with my poking, probing, and cussing, so it cranked up and drove off (with us), and did not miss a lick since then. But I did repair the vacuum leak when I got home. Just past Crede, we were paralleling the Rio Grande River and could see some strong rapids. 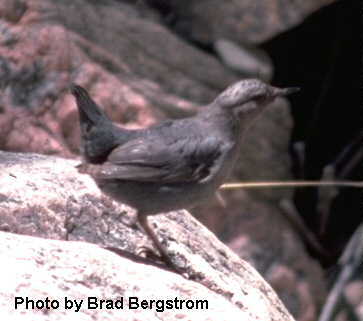 Jim Harman, who has had experience in this area, said the rapids in the area looked like a good place for an American Dipper, also called “Water Ouzel”. We stopped, got out of the Explorer, and immediately spotted a Dipper, a lifer for Deming. The Dipper flew across the river to a large rock at the edge of the rapids and met another Dipper. We then noticed that they were busy constructing a nest on the rock. We could see that the nest looked like a horizontal tunnel with the opening facing us, a strange nest for a strange bird. For some reason, when I try to think of something familiar to everyone for comparison to the Dipper nest, the center of a roll of toilet paper is all that comes to mind. Guess I know where my mind dwells. We headed on to Alamosa and stopped for the night. Next morning, April 9, we went to the Alamosa National Wildlife Refuge and visited with the Manager who is an old friend of mine. When I requested it, he immediately gave us permission to use automatic weapons to go Whooping Crane hunting on the Refuge (as you can see, he knows me well.) Much to our chagrin, we found that we had neglected to pack ammunition so we were unable to do any good. We headed east from Alamosa and detoured north to see the Great Sand Dunes National Monument, an impressive pile of sand. Inside the monument, we got very close to Pronghorns and Mule Deer which were tame due to protection. As we drove out to a parking area near the dunes, we spotted several Clark’s Nutcrackers, and Deming got excellent views of this bird which was a lifer a day earlier. Near the parking lot, we were walking among a grove of trees when Gill flushed a Long-eared Owl from a juniper tree. We then took a long hike on a trail in the sand which was very strenuous. It is very hard to make progress in loose sand. We left the sand dunes and continued east to Fort Garland, and then turned south toward Taos, New Mexico where we wanted to visit the ski area. The realty office at the Taos ski area has maintained bird feeders the past few winters and it has become one of the premier places to observe all three Rosy Finches. However, it was late in the season and I was not confident that the Finches were still there. We drove to the ski area, and to the realty office high on the opposite bluff. There was very little or no snow on the slopes and the place was very quiet, but the employees were at the office. I asked them if the Finches were still using the feeders and they said a few were, but they were very irregular in time of appearance. So we got comfortable and waited. The feeders attracted many birds as we waited. We saw Pine Siskins swarm the feeders in large numbers. Several Cassin’s Finches made raids on the seed and gave all of us excellent views of this species for future reference. There were about six Mountain Chickadees working the feeders and flitting about the spruce and fir trees. 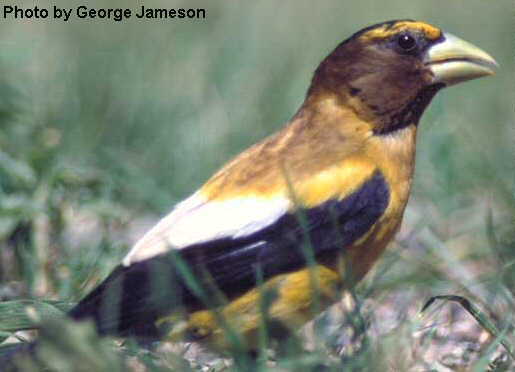 Also, there were four Evening Grosbeaks that came to the feeders and gave Deming another lifer. But alas....no Rosy Finches. It was getting late and we had a long drive ahead, so we surrendered and pulled out (the Finches probably appeared five minutes later). We returned to Taos and toured a bit looking for Marshal McCloud before getting back on the road. We headed east and saw the scenery of Palo Flechado Pass at 9,101 foot elevation, and then drove through Angel Fire and Eagle Nest; what names! And what scenery! We reached Springer where we turned east on highway 56 to Clayton. We saw another dry-land Osprey looking for a taste of water along this lonesome, dry route. We had wanted to see the Kiowa National Grassland north of Clayton, but it got dark as we were losing an hour in the time zone change, so we drove north through the grasslands in the dark, headed to Kenton. At about 9 PM, we arrived at Kenton, which is almost like our second home after all the trips we have made there, and went directly to Monty Joe and Vicki Roberts’s Bed and Breakfast, unloaded the Explorer, and then drove to Camp Billy Joe to listen for a Poor-will. The wind was gale force and we could hear nothing but wind in the trees. We had the same result a little later in trying to call a Western Screech Owl behind the Roberts’s place. Next morning, April 10, we were up before daylight and the sky was crystal clear, showing a spectacular Milky Way and a sky full of stars in the absence of light pollution, a condition which regularly brings astronomers to the Black Mesa area. But the jewel of the morning was sitting in the northeast sky; it was the comet Ikeya-Zhang which had returned to our night sky for a few days after completing its 341 year orbit. Its long tail was very clear in binoculars and its body was fuzzy looking through the spotting scope. It was a real treat to see something that nobody else, except astronomers with big telescopes, will see until the year 2343! Dawn arrived so we headed to the kitchen and had one of Vicki’s breakfasts that could feed a football team, and headed out to spot some western Oklahoma species. At Regnier Ranch, east of Kenton, we found Steller’s, Western Scrub, and Blue Jays, Common Ravens, Spotted Towhees and Mountain Bluebirds. This Ranch has always been a hot spot for birding at the Mesa and is the site of Sutton Canyon, named for the great Ornithologist, Dr. George Sutton. We drove northeast to Benton’s Ranch to look for a Lewis’s Woodpecker as we did not have one yet in Oklahoma, but we had no luck. Down the road a bit farther we did get a close look at a Long-billed Curlew. You can see its picture on the Sutton Center web page. As we continued east, we spotted a Swainson’s Hawk and a covey of Scaled Quail before we reached Alva for the night. On April 11, we drove to Cherokee immediately to see if there might still be an Inca Dove in town. We called Anne Wilbur, the birdmeister par excellente of that area, and she reported that the Dove had been gone for some time. We drove to the nature park in Cherokee, which Anne had designed, and parked by a small wet area which is famous for attracting migrant birds of various species. It is kind of like an oasis. We were very pleasantly surprised to see a Northern Waterthrush at the waterhole, not more than 50 feet away. The Waterthrush was early and rare so far west, according to the OOS Date Guide, so we were very pleased. We left to find Anne to tell her of this bird and, as we searched, she drove right by us at an intersection. We pursued, honking and flashing headlights until she stopped and we gave her the news. She immediately drove there and was able to see the bird. We drove southeast of Cherokee to the town sewer ponds, a magnet for birds. En route we stopped at the cemetery to see nesting Great-horned Owls, a local attraction. At the sewer ponds, we found Semipalmated, Baird’s, and Western Sandpipers, and Wilson’s Phalaropes, plus a variety of Ducks. We are not really bizarre people hanging around sewer ponds and graveyards and looking for birds; I promise! We drove to the selenite crystal-digging area on the southwest side of the Salt Plains National Wildlife Refuge and out on the salt flats. The wind was still very strong but we found Snowy Plovers running about on the sand. We then drove north to the Fish Hatchery and found a Willet and Snowy Egrets, and then to the marsh northwest of the Fish Hatchery which is good for Rails and Moorhens, but it was dry. En route, we stopped to check some birds in a sheep pen by a house. We saw something on the ground thrashing about and surrounded by a few feathers. It was two Eastern Phoebes lying on the ground, locked in combat. They were pecking, and scratching with their feet, which explained the dislodged feathers. We watched them fight for about five minutes before a road grader came along and we had to move, never knowing who won that struggle of avian Titans. We returned to the Refuge and drove around the auto tour where we found Cinnamon Teal, Yellow-crowned Night Heron, Hooded Merganser, Yellow-headed Blackbird, Tree Swallow, and Eared Grebe. The good birds just kept coming which made us birders, who are so accustomed to crushing disappointment, feel rather uncomfortable, but appreciative. We headed east and hit the only snag on the trip; we went to Sooner Lake, which is inside a power generating plant, and were refused entry. Our names were not on a list of Audubon members kept at the plant, which meant we were not to be given access by a very sad Deputy Sheriff, but those are the rules. They checked the list twice and could not find our names so we retreated, headed east and made a beeline for home, picking up Purple Martins in the home stretch. We saw many more birds that I did not list because they are expected and common. Our bird count for the trip totaled 147 species, of which 133 species were seen in Oklahoma, and 14 species were seen in Colorado and New Mexico. The trip distance was about 2,800 miles but we all enjoyed it. I think we all agree that the Gunnison Sage Grouse dance was the highlight of the trip, but other birds such as the Barrow’s Goldeneyes and American Dippers were also high on the list. We highly recommend this trip to other birders as therapy for bird deficiency syndrome. The only trouble is that the cure is very addictive. We are all now birding junkies–maybe we can add a Gutter Snipe to our list when we hit absolute bottom.